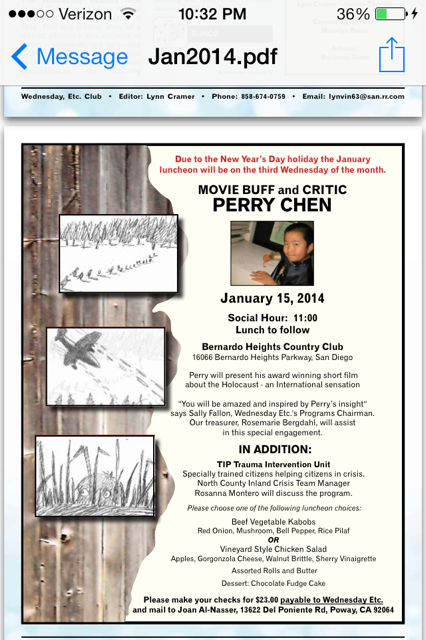 Wednesday Etc., a San Diego-based women’s club has invited Perry S. Chen, a 13-year-old celebrity award-winning animator, artist, illustrator, and film/entertainment critic to speak at its monthly gathering on Wednesday, January 15, 2014. Perry will be speaking about his budding career in animation and movie review, doing art and computer animation demos with tin foil, and using Toon Boom Animation software, and a Wacom digital tablet. Toon Boom and Wacom are also corporate sponsors to Perry and his animation films. Perry will also share with the audience a trailer of his new animation short about his late father “Changyou’s Journey”, as well as screening his awards-winning, Oscar-qualifying first animation film “Ingrid Pitt: Beyond the Forest” about a young Holocaust survivor. 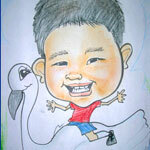 “When you make art, the only limitation is your imagination”, said Perry. “You will be amazed and inspired by Perry’s insight,” said Sally Fallon, Wednesday Etc’s Program Chairman. 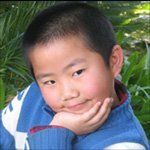 Perry will be Wednesday Etc’s first teen speaker. For further information, please contact Zhu Shen, 858-761-7955. Wednesday Etc. is a social club founded in 1973 whose primary purpose is to provide opportunities for women to interact with other women for fun and friendship. It is the top social women’s club in North San Diego with 203 active members and monthly events. The organization supports many community service projects during the year through various donations of food, clothing, time, and money. Wednesday Etc. was so named because it originally met on Wednesday. The tradition is maintained with a luncheon on the second Wednesday of each month. 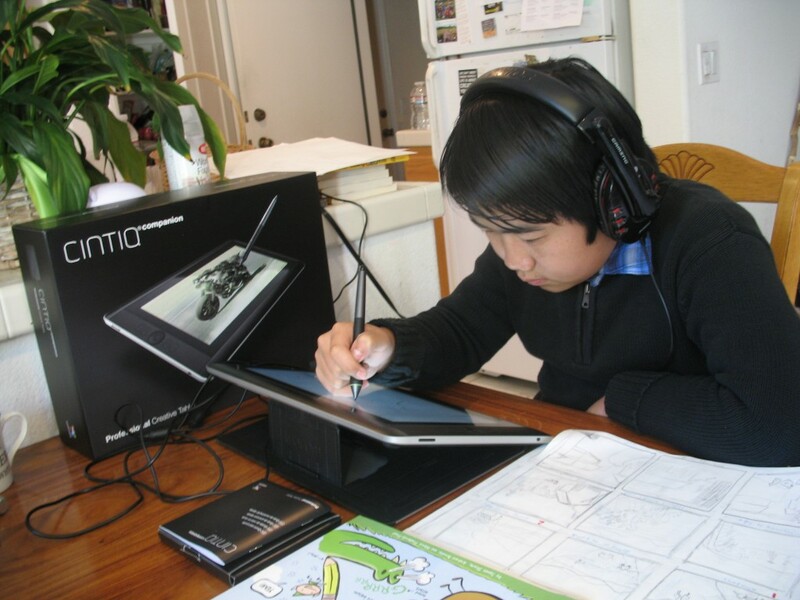 Perry S. Chen is a 13-year-old award-winning animator, artist, renowned film and entertainment critic, TEDx speaker, and entertainment personality, currently in 8th grade from San Diego. Perry won the inaugural “2nd Screen Global Con Junior Innovator of the Year Award” in 2013, “Excellence in Journalism Awards” from San Diego Press Club in 2010, 2011, and 2013 for his movie and restaurant reviews, an “Excellence Writer Award” from “We Chinese in America” Magazine in 2010 for his movie review column. Perry is widely recognized as an authoritative spokesperson about movies for his generation, and appears frequently at red carpet movie premieres, press junkets, awards, and film festivals, interviewing prominent directors from such films as Wreck-it Ralph, Toy Story 3, Up, How to Train Your Dragon, Kung Fu Panda 2, and Despicable Me. Perry and his producer mom Dr. Zhu Shen are featured in a book about parenting and youth entrepreneurship, “The Parent’s Guide to Raising CEO Kids,” published in Aug 2011. Perry-designed Thank-You cards with animal alphabet are currently sold at the gift shop of the Reuben H. Fleet Science Center in San Diego.